How should my kiln be maintained on a regular basis? Turn off the kiln at the circuit breaker or fused disconnect switch. Check element holders and walls for glaze, clay chips or anything that could melt at a high temperature. If melted clay or glaze comes in contact with an element, a rapid failure could result. The molten material traps the heat radiating from the element and subsequently raises the surface temperature of the wire. The temperature will quickly pass the maximum recommended for the wire and burn it up. To clean holders, a good shop vacuum will handle dust and loose crumbs. A very gentle chisel or grinder may help with glaze contamination on element holders, but remember that the elements themselves are quite brittle when they are cool. Replace the contaminated holder if you can not clean it. Remove any glaze that has splattered on the firebrick or shelves. (USE SAFETY GLASSES WHEN DOING THIS BECAUSE GLAZE CAN BE LIKE BROKEN GLASS). Vacuum afterward. VACUUMING NOTE: It is possible to build up a strong static electricity charge when you are vacuuming. If this somehow manages to discharge into the control it can ruin the electronic circuit. Make sure the vacuum is grounded and periodically touch some grounded metal surface away from the kiln to discharge the energy. Make sure the tops of the shelves are coated with kiln wash as it will keep running glaze from ruining the shelf. Some people also apply the kiln wash to the kiln bottom. Because this has both its benefits and detractants, we recommend that it only be done based on the kiln user’s individual preferences. (Do not coat the undersides or the sides of the shelves because you do not want the kiln wash to fall off into the kiln). Keep a kiln log of firings. Tracking the performance of your kiln over time may turn out to be an extremely valuable tool if you ever need to diagnose future problems. Remember that you can easily get the firing time and final temperature at the end of the firing by hitting the Prog Review button if you have a DynaTrol. Check temperatures of the main power cord at the main receptacle and the main kiln breaker while the kiln is at its hottest. If these are hotter than normal, it could be a sign of a loose or corroded connection, or possibly the wire gauge used in the power hook-up is the wrong size for the amount of current being drawn by the kiln. Immediately diagnose and fix this because it could cause a fire. If you have a plug on your kiln, unplug it from the receptacle and check for oxidation, any burn marks, discoloration, or melted spots on the plug. If you see this replace the plug (and the receptacle) before using the kiln again. Make sure the receptacle feels tight when you press the plug into the outlet. A loose receptacle indicates worn springs, which will lead to overheating. NOTE: An oxidation inhibitor can be used on the plug’s prongs. Check element resistance. You will need a digital multimeter (see the Troubleshooting Guide). Keep track of this information. Check tightness of case and retighten if necessary. (the case will expand and contract during each firing and may eventually become loose. Brick also shrinks slightly with use - especially if used at the higher temperatures like cone 10). If you have a manual kiln (or the Orton AutoCone backup on an automatic kiln) be sure it is properly adjusted. See the AutoCone instructions. Overfiring could result. The tube assembly should be replaced if it gets overly corroded or contaminated with condensed glaze or other materials. Orton recommends checking the pivot point for corrosion and sluggishness every 6 to 12 months. Check wires for deterioration or oxidation. Replace any that seem brittle or where the wire insulation has deteriorated or fallen off. Check terminals for oxidation (discoloration). If you are near salt air or if you notice corrosion on the stainless exterior of the kiln for whatever reason then do this far more frequently. Check power connection terminals in the kiln and control box for tightness. Be sure to do this with the power disconnected (unplugged) for the kiln. 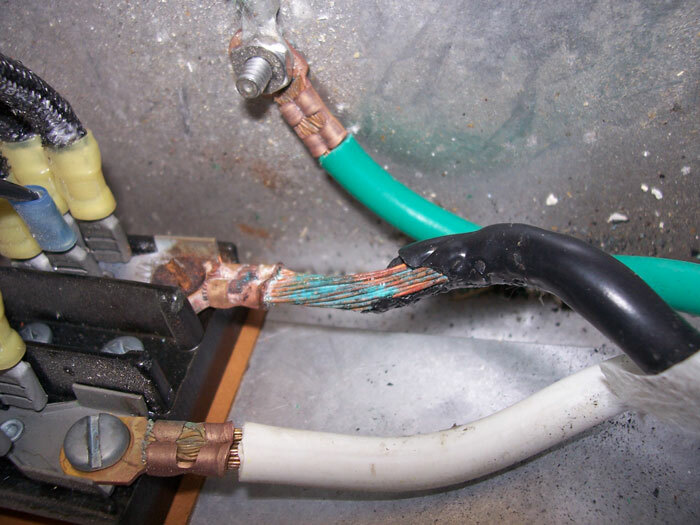 If these terminal connections get loose, heat can be generated (because the electrical resistance gets greater) and this can cause a fire. Thermocouples will drift in reading over time. This could potentially lead to an overfiring before the thermocouple actually fails. Although you can not easily check thermocouple calibration, the general accuracy of the entire kiln system can be checked by firing with witness cones. See troubleshoot-cones.pdf.